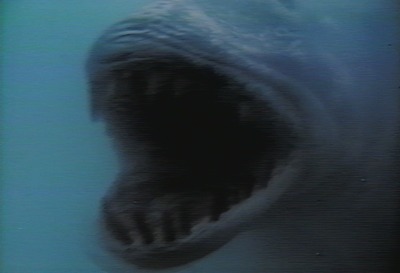 UP FROM THE DEPTHS: A Toothless Terror In The Sea Of Schlock – Schlockmania! In 1978, New World Pictures released Piranha. It negotiated the space between humor and horror with style, made a bundle of cash and earned a much-deserved reputation as one of the company’s finest releases. However, that wasn’t the only seafaring schlock that Roger Corman cooked up around that time. He also produced Up From The Depths in the same period. Like Piranha, it took its inspiration from Jaws and mixed humor into its horror. Unfortunately for the viewer, that’s where the similarities end. The plot offers a serviceable setup: Vacationers begin to disappear and half-eaten sealife washes up on shore near a scenic resort on the island of Maui. Nervous hotel manager Oscar (Kedric Wolfe) wants the trouble kept quiet and suspects that local tourist-fleecing layabouts Greg (Sam Bottoms) and Earl (Virgil Frye) are pulling some scam to siphon off his tourist trade. Hotel P.R. person Rachel (Susanne Reed) is dispatched to warn Greg and Earl – she also happens to be Greg’s main squeeze – but they both claim innocence. The source of the troubles is soon revealed to be something much worse than an anti-hotel scam: an undersea earthquake has released a giant prehistoric fish that is now preying upon the locals. 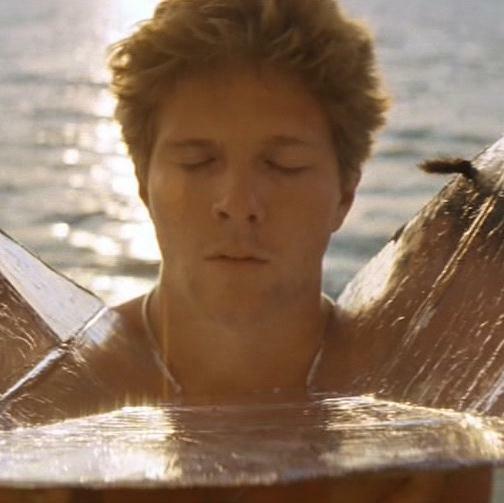 Oscar tries to turn this misfortune into a promotional event by encouraging the tourists to hunt the fish for a prize, thus making it necessary for Greg to team up with local marine biologist Dr. Whiting (Charles Howerton) to put an end to the aquatic menace before it kills off the tourist trade entirely. Unfortunately, the familiar plot doesn’t translate into excitement. 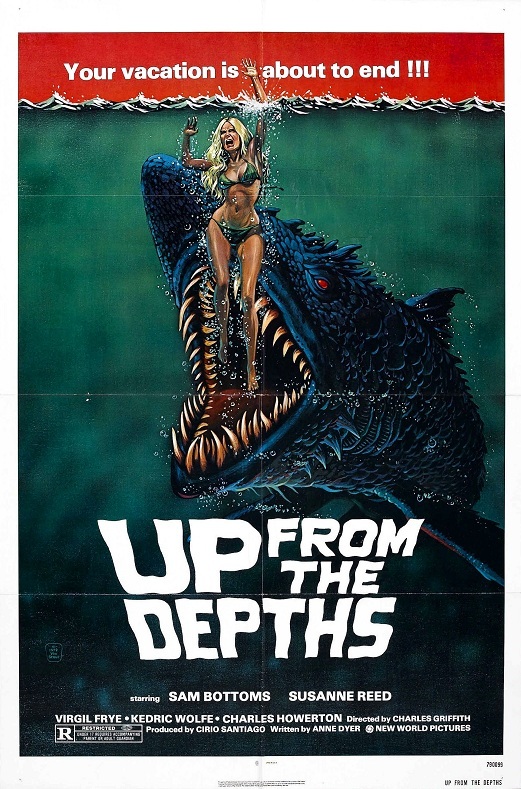 In fact, Up From The Depths is a disconcertingly dull and slow-moving hunk of aqua-schlock. Director Charles B. Griffith was a veteran Corman collaborator but he doesn’t bring much to the table here. Aside from the occasional interesting visual, his directorial touch is rather anonymous. He uses the locales (the Philippines subbing for Hawaii) to decent effect but fails to bring any verve or energy to his work. He’s also weak when it comes to getting performances: Bottoms sleepwalks through his reluctant hero role, Reed is pleasant but bland and Wolfe and Frye both overdo their comedic roles in an embarrassing and amateurish manner. These many problems might have been forgiveable if Up From The Depths delivered some decent underseas mayhem. Unfortunately, it also falls short on that front. The briefly-seen monster fish prop is ludicrous, the gore is practically nonexistent and the attack scenes are uniformly bungled: each one is a blur of haphazard edits and underwater flailing that never deliver the goods. The end result feels like a particularly uninspired 50’s monster opus that was mysterious plopped down into a 1970’s editing. The patchwork music-library score, which relies on the kind of corny orchestral stingers that went out of fashion in the 1960’s, just intensifies the film’s out-of-place, out-of-time feel. In short, Up From The Depths is one of the worst New World Pictures releases. Even if you’re a diehard fan of this studio, this terror tale is rough going. Up From the Depths: A series of mysterious aquatic attacks indicate the presence of a previously unknown giant species of shark that has risen to the surface and is preying on tourists and fishermen. Demon of Paradise: Hunters become the hunted when illegal dynamite disturbs the age-old slumber of a carnivorous lizardman.